THE REVIEW: I’ve seen a lot of war films and most seem to include some sort of basic training/boot camp sequence at the beginning of the film. Oftentimes, the training sequence is my favorite part of the film (à la Full Metal Jacket). Watching it in Hacksaw Ridge, the training and Desmond Doss’ (Andrew Garfield) life before joining the military seemed not well thought out. By the end of the film, it became clear how well and important the training scenes are to Doss’ story and the impact it can have on you as a viewer. Despite gaining some relevance by the end, the early parts of the film could’ve been better from a first-pass point of view. For me, the appeal of Hacksaw Ridge was seeing Desmond Doss rescue 75 soldiers on the battlefield when the rest of his troop retreated. It was selfless, brave, and as the Medal of Honor he was awarded indicates, above and beyond the call of duty. It’s even more amazing considering he didn’t carry or handle a weapon (and was the only on the front lines who didn’t in WWII) because of his religious beliefs and personal life events. Now here’s the conundrum: in order for the end to have the effect that it does, and see not just the physical struggle Doss goes through rescuing 75 soldiers behind enemy lines but the personal/emotional struggle as well, you need to witness the beginning. The opening of the film, starting with the Doss brothers as kids and then going to Desmond pursuing his future wife Dorothy (Teresa Palmer) is all necessary for the end. They are all parts of the same whole and you cannot have one without the other. But either through fault of the script or of Mel Gibson’s direction, Hacksaw Ridge lacks a flow or structure that make all the pieces seem like they fit. 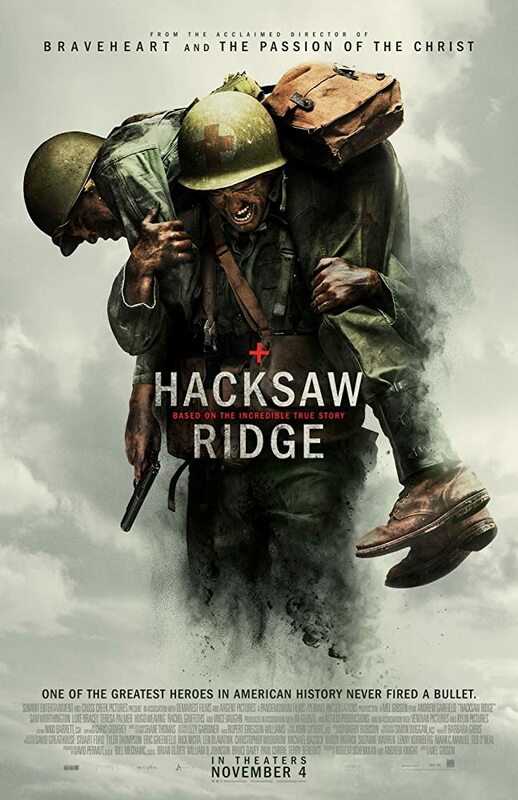 All war films don’t need a basic training sequence (see: Saving Private Ryan) and everything need not be a remix, but on first viewing, Hacksaw Ridge takes something out of the enjoyment of the film. You get there by the end of it and looking at it in retrospect, Gibson accomplishes some pretty amazing things, but unlike some of his previous films (Braveheart, The Passion of the Christ), this isn’t a start to finish tour de force. Andrew Garfield deserves his Best Actor nomination and is my choice for winning (unfortunately I didn’t see Fences where Denzel Washington is also nominated and is competing with Casey Affleck for the trophy). We’ll find out in a few hours, as of this writing, who will actually win.